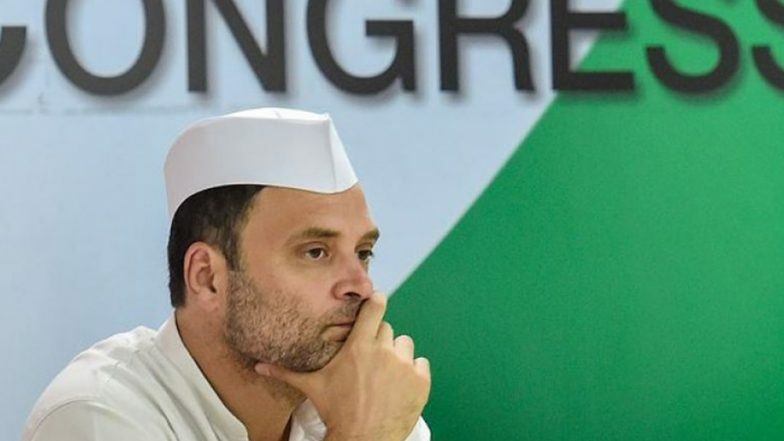 New Delhi, March 20: The Aam Aadmi Party (AAP) on Wednesday said Congress President Rahul Gandhi was not keen on seat sharing in different states in 2019 as he believes that he has no chances of winning the Lok Sabha battle and was eyeing the 2024 elections. "RG (Rahul Gandhi) believes he has no chance in 2019. He is eyeing 2024. Sharing seats now will diminish RG's 2024 dream," AAP spokesperson Saurabh Bharadwaj tweeted. He also said that BJP strategists had asked the media to make 2019 a "Modi vs RG" contest. Mayawati Says She Won't Contest 2019 Lok Sabha Election. "RG is basking under manufactured illusion though it is a trap by the BJP. In parallel, RG jokes are being pushed hard by the BJP," he said. For the coming Lok Sabha polls, the Congress is not very keen on sharing seats with other parties, be it in West Bengal, Uttar Pradesh, Bihar or Delhi, Bharadwaj said. This was against the idea of a Grand Alliance which had planned that there should be one candidate in each constituency against the BJP to avoid splitting of anti-BJP votes, the AAP leader said.